Welcome to the home of Clint McCall and Devon Malone! Ebooks For Your Kindle, Nook, Kobo, and More! 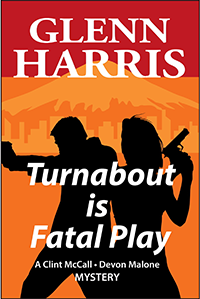 “Glenn Harris’ Turnabout is Fatal Play is perfect for fans of Dashiell Hammett and John D. McDonald, readers of classic Noir, mystery, and PI novels, but the Clint McCall-Devon Malone series is also great for anyone who loves and admires a terrific story chock full of fascinating characters and plot points that pivot on a dime.” — Robert W. Walker, author of Dead On, Cutting Edge, and Killer Instinct. 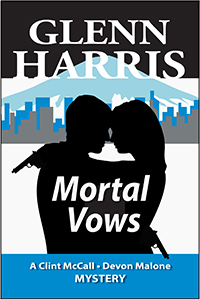 In this combination old-fashioned detective novel and modern romantic thriller, Portland (Oregon) private detectives Clint McCall and Devon Malone each have a client who wants to catch a cheating spouse—and the clients are married to each other! That should be complication enough, but pretty soon there are dead bodies, a local crime boss, out-of-town gangsters, and nasty young punks all thrown into the mix. 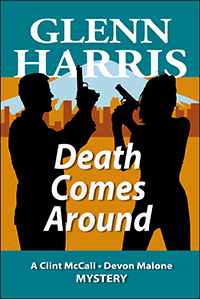 The punks are out to get McCall, the gangsters are threatening his daughter, and the crime boss is after everybody. On top of all that, and much worse, the dead bodies mean that there may be a new serial killer in town. 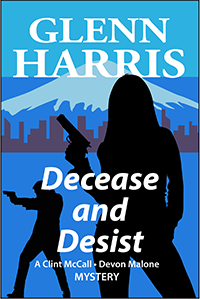 McCall and Malone have to work together, bickering all the way, to help their clients, protect themselves and stop whoever is killing young women in downtown Portland. Clint McCall and rival PI Devon Malone are together again, this time on a case that grows from the embarrassing but minor theft of a friend’s key ring to a series of killings and kidnappings that could include one or both of them before they’re done. If that’s not enough, life throws in a landlord who thinks his mother-in-law may be trying to kill him, an old enemy coming back around to ask for help, and Clint’s daughter worried about a possible stalker. Will McCall and Malone be able to sort it all out and uncover the twisted fantasies of a powerful madman in time to prevent more deaths, including their own? Private investigators Clint McCall and Devon Malone are just getting comfortable with their new agency when McCall suddenly finds himself on the run from the police, accused of sexual assault, kidnapping, and possibly murder. 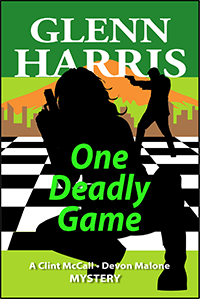 A new player is in town and he’s decided McCall and Malone will make the perfect pawns in his game–a game with millions of dollars and many lives at stake. Once again McCall and Malone are in jeopardy as they very tentatively explore a relationship. A young man named George Heatherly wants the two Portland, Oregon, private investigators to simply look into the finances of a local charitable organization involving his wife’s family. Meanwhile, a friend of Clint’s asks them to protect a young woman who has escaped the street life and doesn’t want to go back. Both should be simple enough cases—so who is trying to kill Clint and Devon, and why? As they try to cope with their own relationship, the past comes around to haunt both Clint McCall and Devon Malone: an old foe seeking revenge on McCall and an estranged relative seeking help from Malone. Meanwhile, they’re hired by a woman to find her daughter who’s been missing for more than a decade and might now be a member of a sinister cult headquartered in the Portland area, a cult apparently willing to kill to protect its own. McCall and Malone find themselves facing deadly threats from both the past and the present as they desperately race to find the young woman and keep themselves alive. The long-awaited prequel to the McCall-Malone Mystery series! 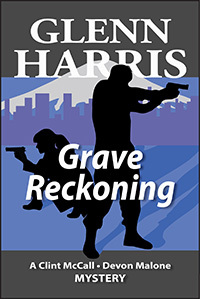 Portland PI Clint McCall runs into–and up against–Portland Police Detective Sergeant Devon Malone as they race to find a kidnapped young girl who may be in the hands of a killer. And that’s just the beginning of what McCall is up against, since his ex-wife has reappeared after an absence of years, apparently with a killer after her as well! Who will die and who will survive? And why would Malone ever speak to McCall again? It’s a critical time in both the relationship and partnership of Clint McCall and Devon Malone. Malone has accepted McCall’s proposal and they pick up one of their oddest cases ever: a client wants them to reassure her that her son is not a dangerous psychopath. Easier said than done. 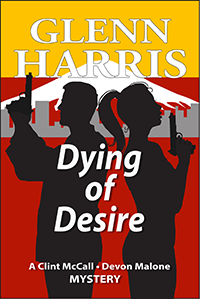 At the same time, old friends and lovers of Malone begin to die–and the deaths seem to be getting closer and closer to her. Is it all coincidence or is someone out for vengeance? And what if that kid IS a dangerous psychopath? Our two detectives have to scramble for their lives to ensure that they ultimately have a marriage rather than a funeral. Sometimes what happens in Las Vegas doesn’t stay in Las Vegas. Clint McCall and Devon Malone are hired by an eccentric retired librarian who says someone is trying to kill her. They have to determine whether that’s true, who it is if so, and stop them. At the same time, someone is stalking Clint’s daughter and she may be in even more danger than the client. Do McCall and Malone need to stop two killers, one of whom would be striking really close to home? Save When You Buy The First Three Books In One! 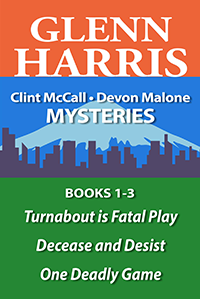 Buy The Clint McCall – Devon Malone Mysteries Omnibus Volume One omnibus and get the first three books—Turnabout is Fatal Play, Decease and Desist, and One Deadly Game—in one giant ebook edition. Cover designs by Cathleen Rehfeld who can be found at crehfeld.blogspot.com/. See the Series page for book purchasing information.